1.Free Lifetime Map Updates: your routes are sure to reflect the most up-to-date maps, POIs (points of interest) and navigation information. 2.High Quality Voice-activated NAV Speak, and intelligently responds; hands-free safely hold the wheel. ※Android AllWINNER A33 Quad-core 1.5GHz 1G RAM+16G ROM+32G Flash C10 High Speed Memory Card※makes the device works smoothly and the 32GB Micro SD card provided allows Loop Recording with more HD front view video recording and rear view video recording storage. TF card up to 64GB. ※A SMALL TABLET IN YOUR CAR※Build-in Bluetooth, Wi-Fi Hotspot, Navigation, Online maps and other available functions. AUTO Power on Video and Sound Record G-sensor, Automatic switch the screen when reversing. Waterproof Rear-view Night Vision against bad weather. 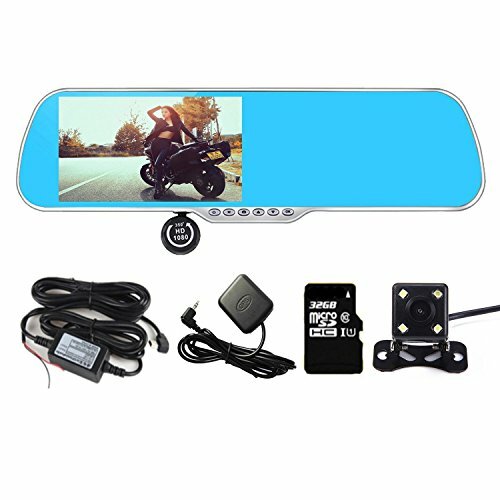 ※Anti-glare 5" HD Cam High Brightness Capacitive Touch screen & PICTURE-IN-PICTURE DISPLAY※Eye Protection and Against Reflection which can avoid Blind Angle cause by glare and the Front View and Rear View videos are displayed on the screen in a picture-in-picture appearance. One-button switch can toggle the display of the two views in either the full screen or the inset window respectively, or turn off the P-in-P display. ※3 Meter Car DVR Exclusive Power Box Adapter DC Power Cable (12V to 5V Converter)※with it can make the DVR running 7 X 24 hours . It means that the DVR can monitor all the time. Become the exclusive sky eye and bodyguard of your car. ※Friendly system Easy for operation Simple UI※enjoying good word of mouth of simplicity and operability and all are carefully tested at the factory and before shipment. More focus on user experience! If you have any questions about this product by Panlelo, contact us by completing and submitting the form below. If you are looking for a specif part number, please include it with your message.